← It’s someone else’s baby, people. Get over it. 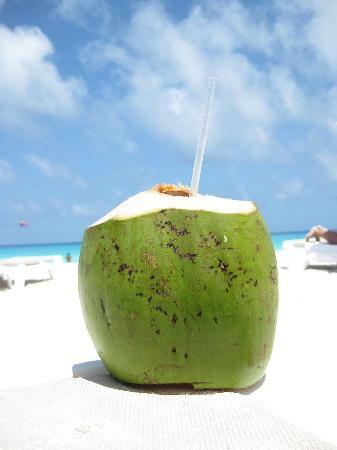 Some years ago on vacation in the Dominican Republic we discovered the tastiest of cocktails at the swim-up bar: the Coco Loco. The bartender whipped up a bunch of booze and, presumably, coconut milk, and served it to us in a fresh coconut with a straw poking out of a hole in the top. The drink was so yummy — and free (hello, all-inclusive!) — the next thing we knew we’d ordered a couple more and were “loco” (Spanish for crazy) from the coco in no time. This is how they serve them in the Caribbean. In Canada, a wine glass works fine. I had no idea what the other ingredients in a Coco Loco might be, but I guessed rum was involved. So when I received a bottle of Malibu’s original coconut flavoured rum I decided to try and replicate the DR’s deliciousness at home. I discovered that Coco Loco recipes vary widely. Some call for vodka in addition to rum (for a Coco muy Loco), others include creme de bananas and still more omit the pineapple altogether. I settled for a recipe featuring amaretto, hoping to capture that sweet, slightly nutty flavour I recalled. While my version is pretty good — sweet, tart pineapple and creamy coconut with a hint of almonds — I liked the DR Coco Loco better. Must be the coconut cup! 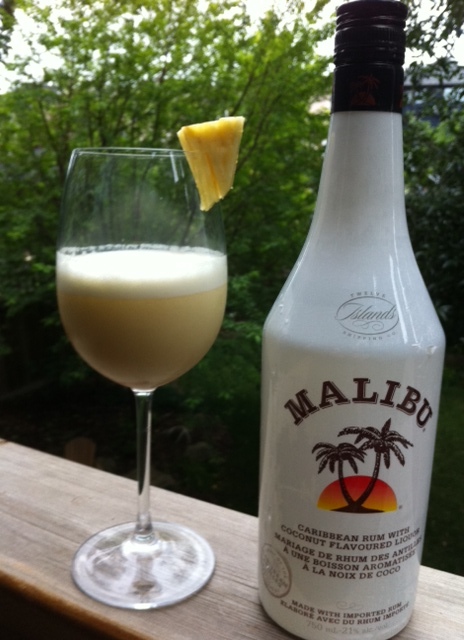 I like Malibu in this drink instead of regular light rum. It adds an extra “coconuttiness” and makes up for the lack of coconut cream. Combine ingredients in a blender and puree until smooth and frothy. Pour into a wine glass (or hollowed-out coconut) and garnish with a pineapple wedge. This entry was posted in Potpourri. Bookmark the permalink. Looks tasty! So what is the difference between a Pina colada and this drink? The amaretto? Which do you like better? Since Pina Colada’s are my favorite drink this is very important! Must be the amaretto! Coco Locos are delish.